How do I help kids be “ok” with struggling and (even better) see the value in the struggle? I teach some incredibly gifted kids in Algebra 2. Algebra 2 is HARD! Some of them experience their first math struggles there. Its a shock. How do I make it better? How do I help them to learn to persevere past the struggle? I have to write those letters of recommendation that I hate to write and that I struggle with writing and yet I do them and make my best effort. How did I learn that? What makes me not give up? What makes me say that I’d do it in the first place? I think that I actually am a “people pleaser” so I don’t give up because I don’t want to let someone else down. But there must be more to it than that. Lots of folks persevere that aren’t just trying to make others happy. Why? How? Again, I encourage my kids – lots of “I know you can do this!” – but I still have a few that find it hard to move beyond it. So MTBoS, I’m throwing it out to all of you. How do you help kids value struggle and persevere? The MathTwitterBlogosphere has been so helpful and inspirational to me that I really wanted to try to give back and participate a little in the challenges over the next few weeks. I don’t promise to be inspirational or even good – just to make an effort to participate! If you’d like to participate – check out the challenges here. 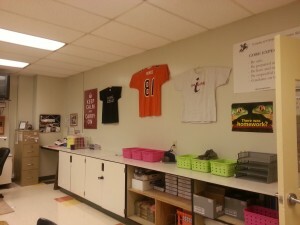 How my classroom is unique to me? Well – to be honest, I’m not sure its completely unique to me because I am the queen of stealing borrowing ideas from others. My table numbers and bins are completely stolen from Shelli (@druinok – queen of Made4Math Mondays.) Other things though I’d like to think of as my own ideas – although they could be stolen too! Please let me know if I need to give one of you credit for one of these. Wall decorations – I had tons of math t-shirts (what you get for any and all occasions when you’ve taught for 28 years) so I decided that they’d be great wall decorations. My kids like them and they hold up great year to year. 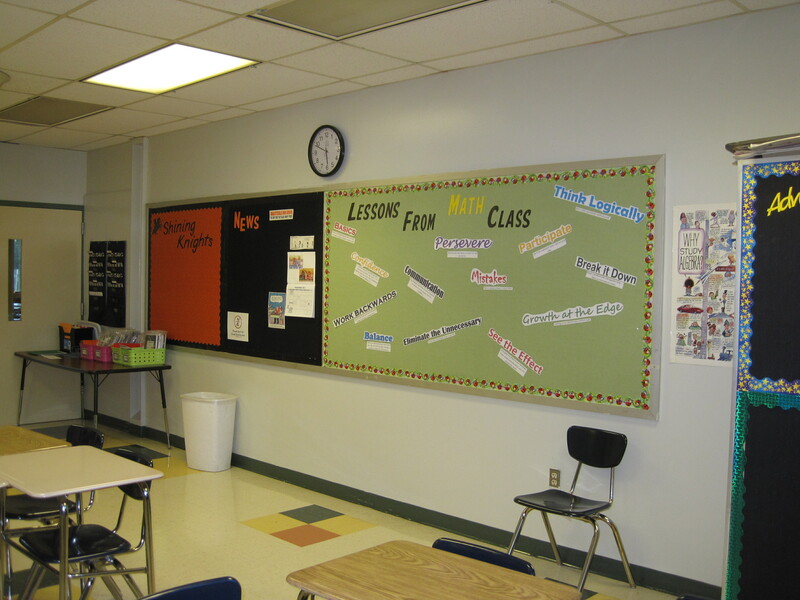 The other unique thing (at least at my school) that I do is that I have a “Shining Knights” board (see the far orange spot on my bulletin board – it was early in the year when I took this – no one up there yet.) We’re the “Black Knights” so that’s where the name comes from. When a student gets an A on a test, scores a winning touchdown or just does something special for a classmate their picture goes up on the board. Yes – I take and print all of their pictures! Its a great help for learning their names at the beginning of the year. They complain a little about having their picture taken but they always want to be on the board. Parents love it when they come to visit too. Now I’m going to double dip a bit and share a Made4Math project that I did last weekend too! 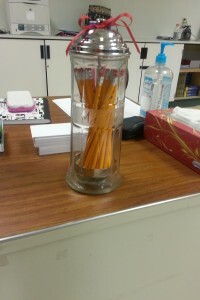 It was originally a jar intended for straws (or soaking hair combs as one of my students pointed out.) 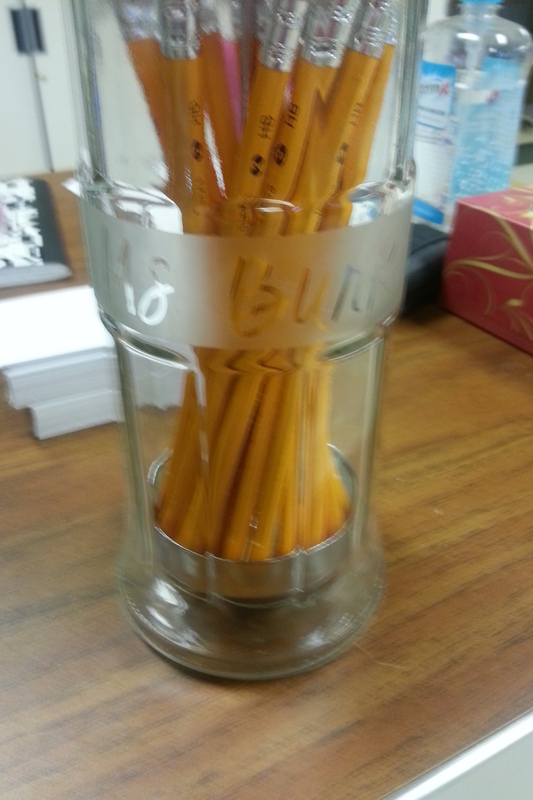 I turned it into a jar for pencils. (Disclaimer – not my original idea. One of my colleagues got one from her mom last year for Christmas. Another stolen idea!) I did etch the glass with my name which I think makes it look cool! So nothing earth shattering here – but I do love my space. Making your classroom your own whether it be by something you do (a friend has dance party Friday) or how you decorate encourages your kids to see you as an individual and helps build those all important relationships! Just like connecting with others online does! Love my friends on the MTBoS. Looking forward to many more explorations! So, to be clear, I love what I do! But, as with any job or calling or even hobby, sometimes you get frustrated. This was one of those weeks. I teach two different “levels” of the same course – Algebra 2 academic and Algebra 2 honors. As you can imagine, the academic level is for those students that might have struggled a little in math before but are college bound and need Algebra 2. The honors is intended for the more gifted math students and those students (primarily 9th and 10th graders) usually end up in AP Calculus AB or AP Calculus BC. My honors class is where I’m experiencing the frustration this week. The honors course is a rigorous one intended to get through not just the required standards (by our state – not Common Core) but also through some introduction to Trigonometry. The material covered goes beyond basic standards at the state but also pushes the student to think beyond that. Its also where some of the gifted students first start to struggle and they definitely were struggling this week. Or at least some are struggling (its way more than I’d like.) My issue is, though, that they aren’t struggling because they can’t understand or do the math, but because they aren’t practicing or asking for help. I have (and believe in) a policy of not grading homework. I don’t grade it for all the reasons other teachers don’t – it should be practice without fear of doing poorly, their grade should reflect their overall understanding without help from others or notes etc. I’ve had that policy for several years and I always hit a spot in the year where I question it. Bam…. hit that spot early this year. This year is a little different though. The classes overall aren’t doing as well as I think they should. I gave a test on Thursday and Friday and they acted like I had never even mentioned some of the concepts. Well beyond the normal, “I didn’t study so I’m going to pretend I’ve never heard of this ” kind of response. Then I had some less than honest attempts at the test (if you know what I mean) and they didn’t seem to care at all about this until the test came around. I know, its almost the definition of teenager only it definitely seems to be worse. All of this seems to be telling me that they don’t know what’s going on and don’t really know how to go about figuring what they can do to fix it. They aren’t making the connection that practice will help them learn and make better grades, that they need to be responsible to take good notes, access the online materials and to seek help when they need it. And studying for math… how do I do that? Do I go back to grading homework? At what cost – I have 130 students. Grading homework every night means not spending as much time on creating interesting lessons. I still believe all those things that made me stop grading it to start with so why change? Do I change my grading policy all together and try standards based grading with them? What are good ways for me to encourage them to take good notes and review and practice outside of class? For me, that’s what studying for math means – review your notes and practice your problems. I’d love to spend more time in class but where do I find it? Flip the class? Not sure they’d watch the videos either. 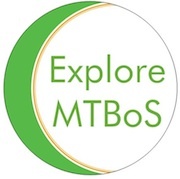 So MTBoS buddies…. help!! 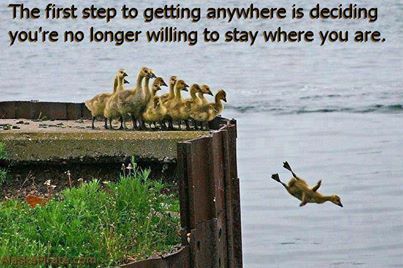 How do you help your students learn to be independent? How do you help them learn study skills and strategies? I’d love comments and suggestions. 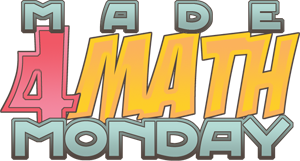 I’ve been wanting to participate in Made 4 Math Monday’s for a long time now but have often felt like I didn’t really have anything new to share. Shelli (@druinok) encouraged me to just go for it… so here goes. Week before last (yes, I’m that behind in my writing) we finished up a unit on Sequences and Series in my Algebra 2 academic class. I really wanted to think of an idea to help my students review that didn’t involve a worksheet review. We are using standards based grading, so individual stations came to mind but we had actually tried something similar (a QR code scavenger hunt) earlier and they just really didn’t get that into it. (WHY?) So – after much thought – I decided to try something different to get them motivated and up and about. A grab bag review! Here’s how it works. I created a bunch of problems (started with about 48), cut them apart and threw them in a plastic bag. I gave my students a chart with 12 slots to complete 12 problems. The chart has a place for the problem number and a place for them to work. Here are those files just in case you might want them. Here’s the link to the word doc: Grab Bag Review. I told them to find a partner and come pick a problem out of the bag. Their task – complete the problem, check it with me and, if it was correct, then they could pick again. (I stashed the problem to the side once a pair completed it so they couldn’t trade problems. I learned that after the morning class! But it does mean that I need more problems!) Finish all 12 for a treat (believe it or not – only a few got through all 12 within our 45 minute period so I didn’t give out many treats.) For treats I used some small cartoon shaped erasers, cool decorated pencils and a piece of bubble gum. They were thrilled. They worked like crazy and did pretty well on their assessment too! So there it is… I’m sure I’m not the first to have that idea but I honestly can’t remember seeing it. If I inadvertently stole it from you please let me know so I can give you credit!! PS – I didn’t include the link to the recording doc – its a simple table with a place for the problem number and work for the problem. So let me start by saying… I’m old… not unreasonably old and not really old in my head but its been a long time since I was the rookie teacher in my school. I’m the one that’s “always been here” and the one that knows all about what was “a million years ago.” On top of just being at my school for a long time I’ve also been the department chair for my department for a long time – a really long time – as long as my daughter has been alive (22 years.) With the role of the “veteran” teacher/department chair seems to come this expectation that I know a lot and that I know what to change and what not to change and probably that I’d be reluctant to change some things – habits and all. Some of those assumptions are true, some are not. Here’s what I’ve discovered as I’ve made some changes….. I know a lot less than I thought I did. Like what might make me happy. I am reluctant to make some changes – like the fact that I’ve been at my school for 28 years (32 if you count my time there as a student) and I don’t want to leave. I’m comfortable. Is that bad? Maybe? Some believe that you can only grow when you’re on that edge of uncomfortable. I’ve been thinking a lot about that… . Sometimes it’s ok to make changes just for yourself. Its not selfish – its actually one of the best things you can do for the world. Positive changes in your own life ripple out to others. Change isn’t always bad – Big change for me is that I’m not the department chair this year. I gave up the position (too long a story for this) and thought I’d be very unhappy. I like being a teacher leader in my building and somehow thought that position MADE me the leader. Guess what? That wasn’t it! I was a teacher leader sometimes in spite of that position and I still am! Its an awesome feeling! If you don’t change, you don’t grow. I knew this and really thought I was doing this. I’m the one who likes the new technology, who likes trying the new technique or mixing up the curriculum outline to try it a new way. That’s not usually what’s expected of the veteran teacher. I thought I was open – and I was to an extent. But somehow I was being held back. Too many other things to do and lots of pressure had me giving up the things I loved the most. I wasn’t growing in my classroom. I wasn’t taking the time to think and try new things. This year there is no easy route for me and, believe it or not, that’s ok. I am excited. My desks aren’t in rows. I’m making my students work harder, think more. I’m doing standards based grading AND interactive notebooks in my NEW prep! I’m working on connecting with EVERY kid (instead of attending every meeting.) Sometimes to change you need to go backwards a little – back to your roots. Find your passion and grow. Sometimes the change is worth the risk. Its scary to jump off the cliff when you don’t know where the water is below. But sometimes the cool dip is worth the scary jump. So I changed some things and didn’t change others and I made some changes even when I wasn’t sure I should. And this time it all worked out. Maybe I’ll be more likely to take the chance next time. So I’m the 50 year old veteran teacher leader who knows some stuff, doesn’t know other stuff but is still growing and I’m pretty excited about that. Here’s to a brand new school year and all the adventures it may bring! If you read my last post, then you know that the blog name here came out of a student comment made right after I finished a lesson that I was particularly excited about. This is it! While it might not seem like much here – trust me, I was excited. I had that “ah-ha” moment that I hope to give my kids. Love it. My Algebra 2 kids had been working on factoring and finding roots of higher-order polynomials. We had done the typical “what do you notice?” with the graphs of the polynomials, talked about types of roots and how we might write the factors and find the roots – both real and complex. We were coming to the end of the unit and most kids understood the why and how of the process but some were still having trouble with the division. We had practiced both long and synthetic division. I had lead them through discovering that they could use synthetic division given any root – even irrational and complex (yes – that’s true – never say never to a kid, they’ll prove you wrong! Math teachers will too – see Never tell me it can’t be done.) They were still struggling – so I was trying to think of a new method. Then the epithany…. We use boxes to multiply – why not divide? So, I searched online to see if I could find it. No luck (I stink at searching – found these later – examples and mathrecreation) So, I tried a few. Guess what? It worked… and seemed pretty easy. Here are some examples. What I really liked about this method was that the kids had to connect the multiplying and dividing. They had to think through it. It doesn’t feel as algorithmic as regular long division. Thoughts? Question – could we apply this in some way to completing the square? The other Algebra 2 topic that makes me crazy! What I love about twitter – sent a tweet out about this post and in no time at all had an answer to my question! Bob Lochel (@bobloch) read my post and responded in his blog, mathcoachblog. And, of course, I had a “well duh!” moment. Please drop over there and read his blog! It makes so much sense and is a much more visual representation than the typical algebraic process seems to be. Thanks Bob! And then there were two! Two posts that is – on my brand new blog. A huge accomplishment for me. I debated and debated about posting this but then decided I specifically wanted to remember this so this is a selfish post entirely for me! 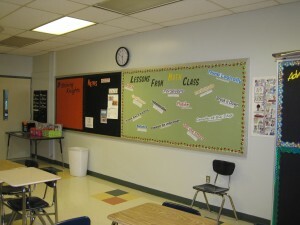 How this blog got its name or one of my best days in the classroom ever! One of the parts of teaching that I really enjoy is just listening to my students while they are working. I hope to hear great mathematical conversations but I often get to hear other interesting conversations – sometimes things I want to hear and sometimes not. One day I overhead a group of my kids debating about the definitions of a Nerd, Dork and a Geek. Their conclusions were ( I paraphrase here) …. Nerd – someone that is smart and passionate about intellectual things but lacks social skills. Geek – someone that is passionate about a topic/thing yet still cool socially. They were actually quite empathetic to others and were really trying to find something positive about each definition. A good thing to see in teenagers! Let’s just say…. LOVE her! Amazing how little moments like that can just make your whole year. They appreciated my “geekiness” and I appreciated the love. Those are the moments teachers live for. So grateful to have gotten that one! Hence the name… More than a Geek … didn’t feel like adding the rest would be appropriate!